The 32nd Palm Beach Boat Show 2017 recently came to a close and we are happy to report that it was another successful event and a must-visit show in the American yachting calendar. This show is one of the top five boat shows in the country and a favorite of Chamberlain Yachts. It took place from 23rd-26th March and featured more than $1.2 billion worth of boats and yachts of all sizes from the world’s leading manufacturers. The famous yacht show returned to downtown West Palm Beach for four days of exclusive exhibitions. The event includes hundreds of boats, covering everything from small inflatables, fishing and power boats to center consoles and, of course, superyachts. This year, a number of Europe’s leading shipyards such as Amels, Heesen and Moonen took the opportunity to showcase their high-quality builds for the first time. Some yachts on display topped 200 feet and were exhibited at a satellite location specifically opened for the largest vessels. A private water taxi transported interested buyers and clients to that satellite location at Rybovich Marina. The 230-foot MARTHA ANN was the largest superyacht on display this year. The magnificent superyacht was built by Lurssen and equipped with all the amenities of a five-star hotel, including a huge gym, a big pool and cinema theatre. Trinity Yachts’ 191 ft SKYFALL was another eye-catching vessel, which has the traditional feel of a classic yacht but with plenty of sports facilities, including a basketball net on the top deck. 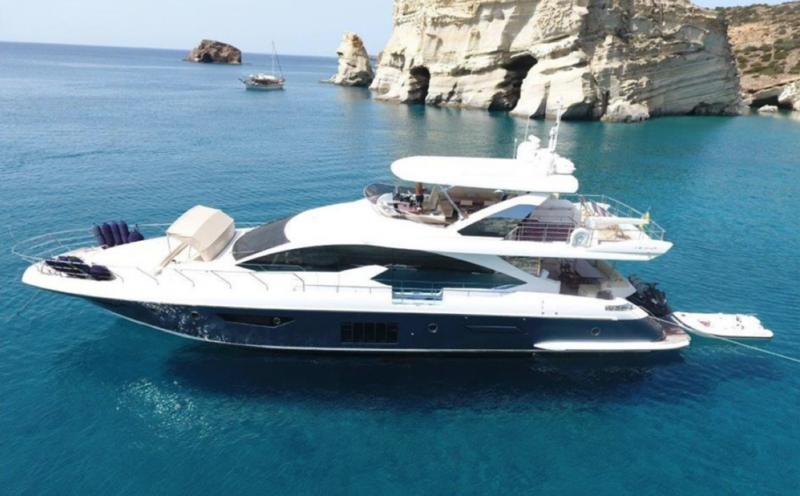 Chamberlain Yachts attended with the 82 ft (25m) M/Y SKYE, a 2015 Azimut. The beautiful yacht has a distinctive blue and white exterior and her spacious interior can accommodate 8 guests in four staterooms. The contemporary interior was designed by Stefano Righini. One of the yacht’s unique highlights is her fully dual continent power capabilities with an Atlas converter and both American and Continental plug outlets. SKYE’s asking price has recently been significantly reduced and now stands at $3,950,000. With zero-speed stabilizers, spacious sundecks and a plush interior she is a top-tier yacht and extremely well-priced for her category. 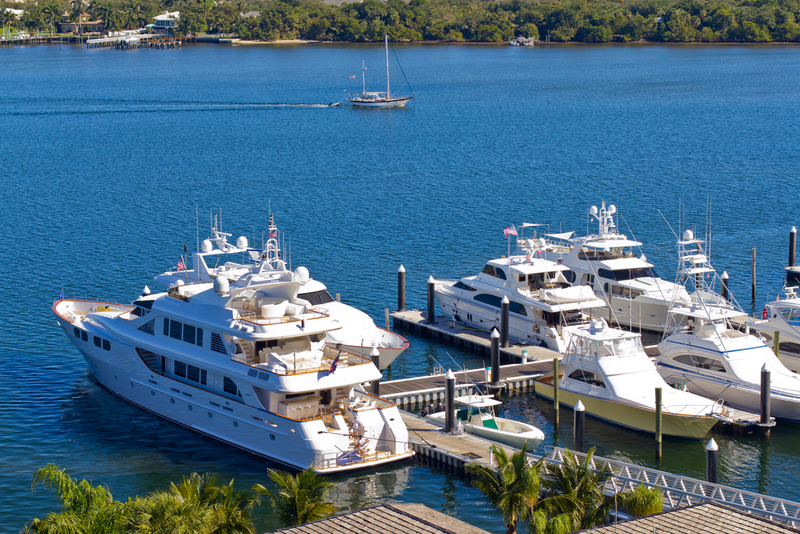 Visitors to the Palm Beach Show generally prefer its convenience compared with the boat shows in Fort Lauderdale and Miami. It’s a smaller show, but easier to access and get around. Taking place along Flagler Drive, the show attracts a blend of affluent locals, serious buyers, enthusiasts, and dreamers from all corners of the world. Besides attracting those looking for yachts for sale in Florida, the show offers plenty for the average sailing enthusiast too. From classes to accessories, boaters and anglers can find something of interest and even children are catered to with fishing clinics. Despite rain on the first day, the sun came out over the weekend and inspired larger crowds. There was plenty of entertainment for the whole family with live music, food areas and cocktail lounges. The AquaZone freshwater pool returned to host live demonstrations, pleasing the crowds with kayaking, stand-up paddleboards and other water toy demonstrations. At the end of the weekend people went home tired and happy, and a good percentage even had some impressive new boat purchases. If you would like any information about our yachts for charter or sale, please contact the friendly team at Chamberlain Yachts.